With less than two weeks till Christmas I love nothing more than snuggling up on the sofa and having a cosy night in. But a cosy night in wouldn't be complete without a tub of Haagen-Dazs new Honey Walnut and cream which is the perfect winters treat. I have been devouring this over the past week or so and have been to stock up on more as it's just sooooo good! 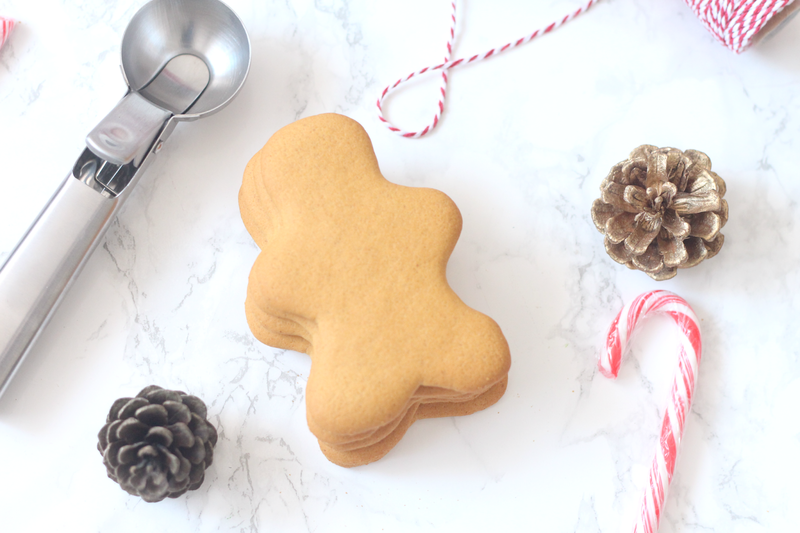 I also had some gingerbread men biscuits left over from the weekend when the kids decorated them so I thought I'd share a recipe with you which is perfect for the festive period. I must admit, I've never been a fan of walnuts as I've always thought they tasted very bland and wasn't keen on the texture. However this Haagen-Dazs ice cream is just deliciousness in a tub! I can't get enough and neither can the kids, but I won't tell them it has walnuts or honey in it as they wouldn't have tried it. 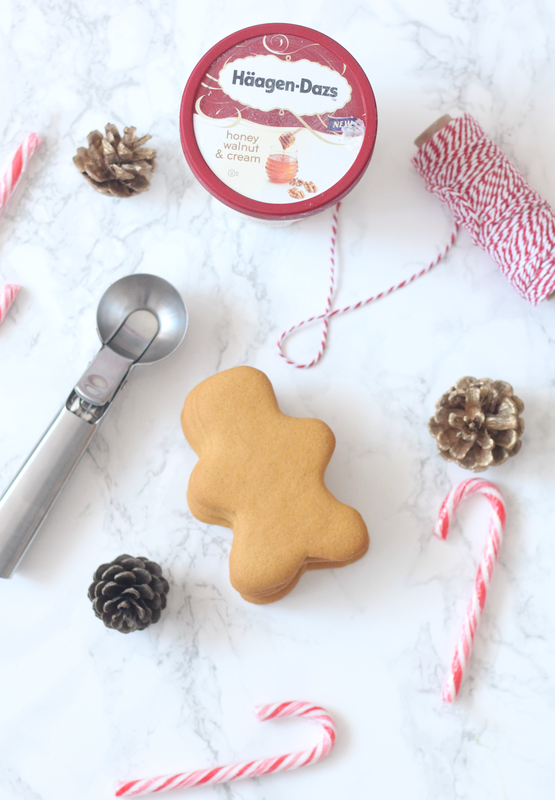 These gingerbread men ice cream sandwiches are super easy to make and take less then 10 minutes from start to finish. The kids loved making their own and eating them afterwards and we can't wait to make them again. You can find the recipe below. 1. 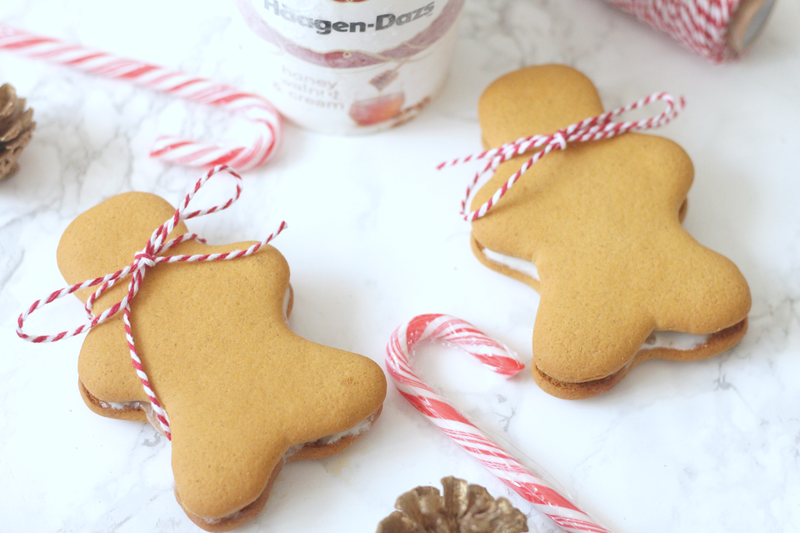 Before starting, take your Haagen-Dazs out of the freezer and leave on the side for 10-15 minutes to soften up. This ice cream is rich and creamy, with swirls of honey and pieces of caramelised walnuts. It's not overly sweet but full of flavour and perfect for everyone of all ages. 2. 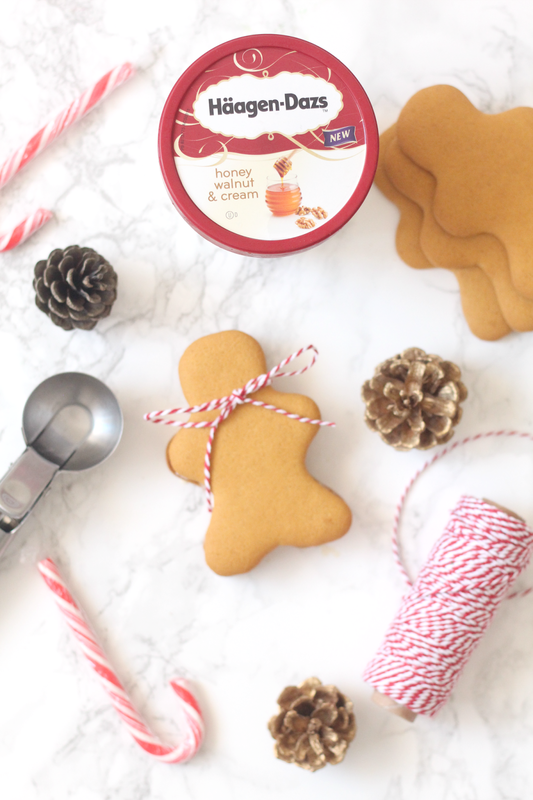 To begin, simply take a knife or spoon and spread the ice cream out evenly on the base of one of the gingerbread men. I bought a pack of 5 gingerbread men from the supermarket however you could make your own with a cookie cutter and get the kids involved. Then repeat with all of the others. I find it easier doing all of the bases first otherwise it can melt a lot quicker. 3. Pop another gingerbread man on top and press down gently. (Not too hard otherwise the ice cream will start to run). The good thing about this ice cream is that the almond pieces make the consistency a lot thicker and it will hold for longer. 4. You can decorate the gingerbread men with icing and sweets if you wish with the kids or simply leave it plain and decorate with some bakers twine like I have. 5. ...and there you have it some cute little gingerbread ice cream sandwiches. These are perfect over the festive period of you have a lot of family and friends visiting or great to do with the kids in the run up to Christmas. The new Haagen-Dazs Honey Walnut & Cream is available from all leading supermarkets – Tesco, Sainsbury’s and Co-Op but is only available for a limited time during the Autumn/Winter season so be sure to stock up and try it before it's taken off the shelves for another year. You won't regret it! * In collaboration with Haagen-Dazs however all opinions are my own and 100% honest. Its a very simple recipe. I tried it today and it was fantastic. My kids loved it. Thanks for sharing. Very easy and simple one. I just made it. Thanks for these awesome recipe.